Marie Waldron is the Assembly’s new GOP leader, the fight over California’s so-called “sanctuary state” laws heads to the 9th Circuit and more in our weekly roundup of news from Sacramento. 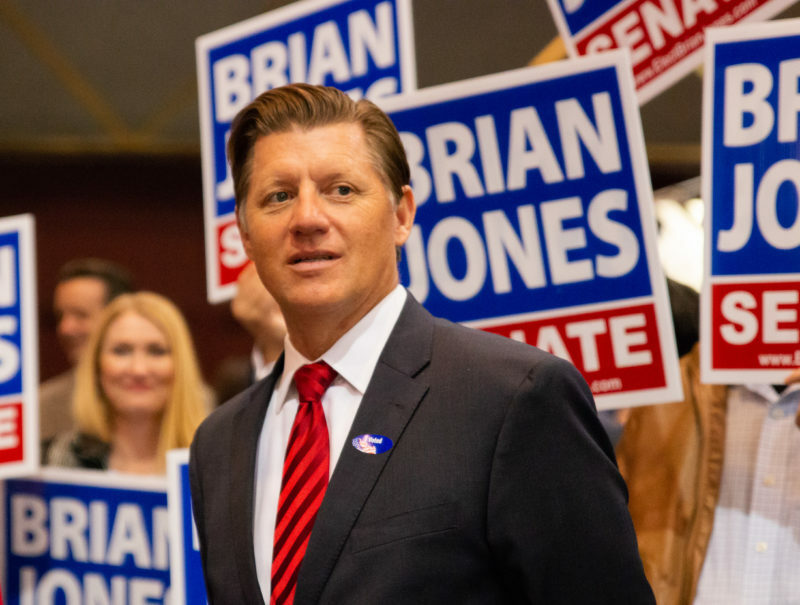 After two years away, Brian Jones is headed back to Sacramento. The former assemblyman served from 2010 to 2016, and was elected this week to the state Senate seat being that Sen. Joel Anderson is vacating. Jones said he’s also been doing some business consulting work during his time away from Sacramento. I spoke with him this week about how he’s approaching his return. So, Democrats might have a super-majority in the Legislature, then you’d also be working with a governor who could be to the left of Jerry Brown on certain issues, how are you approaching returning to Sacramento in that kind of environment? With eyes wide open and with ears ready to listen. Because to be quite frank, I don’t know what we’re getting into in that situation, it’s a unique situation if both the Assembly and the Senate are in the super-minority. We had that situation for a short time after the 2012 election, but shortly after the session began three Democratic senators had to resign and one went to jail. I don’t anticipate that happening again. … So Republicans, we’re going to have a lot of work to do in preparation for the 2020 election. And then there will be more seats in play in 2020. And we’ve got to come up with a message that resonates with voters in California on why we think our policies are better, or at least to protect the one third so that Republicans are able to at least block or manage some of the tax increases and other two-thirds votes that are going to be coming down in the next few years. Are there any interests that come to mind where you think you could work with Gavin Newsom, or places where your interests might align? Well I know in the past he has said he’s not a fan of the high-speed rail. So if he’s going to work on stopping or defunding the high-speed rail that is certainly something I could work on. Some of his environmental conservation stuff I could work on with him – probably not everything. You know, he’s got a business background, so I’m hoping and he has said in the past, that he’ll come in looking at business regulations and what can we do to help our small business succeed in California? That’s certainly something I can work with him on. Are there any issues or bills you plan to pursue right off the bat? My veterans hiring preference bill that died twice in the Assembly, I still want to work on that because I believe it’s the right thing to do. Senate Pro Tem Toni Atkins has said that she wants to work on homeless issues – I’m certainly up for working across the aisle on that because that has become a big problem in California. My cancer registry bill that I did before, I think we can work on that from the Senate side and hopefully get that passed this time. Is there anything you plan to do differently not based on your experience last time, or because you’re in a different part of the Legislature this time around? One of the things that I learned – and I should have known this, it’s obvious – but it’s very relational up there. I already have very strong relationships with members of both parties. I think one of the things I’ll do better, going back, is continue to build and protect those relationships so that when I do need help across the aisle and it’s a policy that my Democratic colleagues can support, that I’m ready to get that support and have the relationship built. A big question I’ve been waiting to ask you … Is “Are You Kidding Me?” coming back? If I don’t bring that back exactly like it was before, I will bring something. I was asked on the radio last night, “How come the voters and citizens of California don’t know what’s happening in Sacramento?” And I told them – I was talking to three talk show hosts from conservative radio – because you guys don’t cover it! They were taken aback a little bit but I told them, it’s not just you guys – nobody comes to Sacramento anymore. The big papers have pulled most of their reporters out of there, TV stations have pulled their reporters out of Sacramento. So, I will do something. If it’s not exactly “Are You Kidding Me?” I will do something similar, because somebody has to communicate what’s going on up there. On Thursday, Assembly Republicans elected Assemblywoman Marie Waldron of Escondido to be their new leader. “We need an aggressive, new approach to message our values, strengthen, grow and expand our party and our caucus as we stand for hardworking Californians. I look forward to leading this effort,” Waldron said in a statement. As vice chair of the Assembly Rules Subcommittee on Harassment, Discrimination, and Retaliation Prevention and Response, Waldron has been involved in the Capitol’s reckoning with the #MeToo movement over the last year. During her time in the Legislature, Waldron has written many bills aimed at expanding access to and information on health services. Her ascension to a leadership role means someone who represents San Diego or parts of it now leads all but one faction of the Legislature. Senate Pro Tem Toni Atkins and Senate Republican Leader Pat Bates lead their parties in the Senate, and Waldron leads Republicans in the Assembly. The Assembly speaker, Anthony Rendon, represents Los Angeles. California Attorney General Xavier Becerra, whose office has frequently sued the Trump administration, easily secured his first four-year term in Tuesday’s election. The former congressman, who was initially appointed AG by Gov. Jerry Brown in late 2016, appears poised to keep locking legal horns with the federal government. Earlier this week, his office filed a brief with the 9th U.S. Circuit Court of Appeals in the case featuring the Trump administration’s challenge to three California laws designed to protect unauthorized immigrants. The U.S. government, which argues the laws improperly interfere with its immigration enforcement work, appealed a federal judge’s July ruling largely siding with the state. The most prominent of the 2017 statutes at issue is SB 54, the so-called sanctuary state law. It limits the cooperation and information state officials can provide federal immigration authorities. The Trump administration also is challenging AB 103, which directs the state AG to inspect facilities housing civil immigration detainees, and AB 450, the law requiring an employer to provide employees with notices about federal inspections regarding their legal ability to work. U.S. District Judge John Mendez of Sacramento sided with California in dismissing the challenges to SB 54 and AB 103. He also upheld the employee notice provision of AB 450, but issued a temporary halt on the state enforcing the portion of the law mandating private employers deny immigration officials access to nonpublic areas of a worksite, or employee records, without a warrant. Becerra’s filing with the 9th Circuit asserts that all of the aspects of the California laws challenged by the Trump administration are a legal exercise of the state’s regulatory power. The Trump administration’s reply brief is due Nov. 26. Oral argument has not been scheduled, said Becerra spokeswoman Jennifer Molina. The U.S. Justice Department filed the case in March under AG Jeff Sessions, who was forced out Wednesday. Time will tell if the DOJ takes a new approach to this case, or others involving California, under Acting AG Matthew Whitaker. Assemblyman Brian Maienschein got more of a challenge than he’s used to, but still comfortably beat Democrat Sunday Gover. Sen. Joel Anderson eked out a narrow win to take a seat on the Board of Equalization. Assemblywoman Shirley Weber won handily – and she got another victory on Tuesday night, too. Her daughter, Akilah Weber, appears to have won a seat on the La Mesa City Council. CALmatters’ Dan Walters says the bail bond industry has submitted signatures for a 2020 referendum on this year’s law reforming the industry.